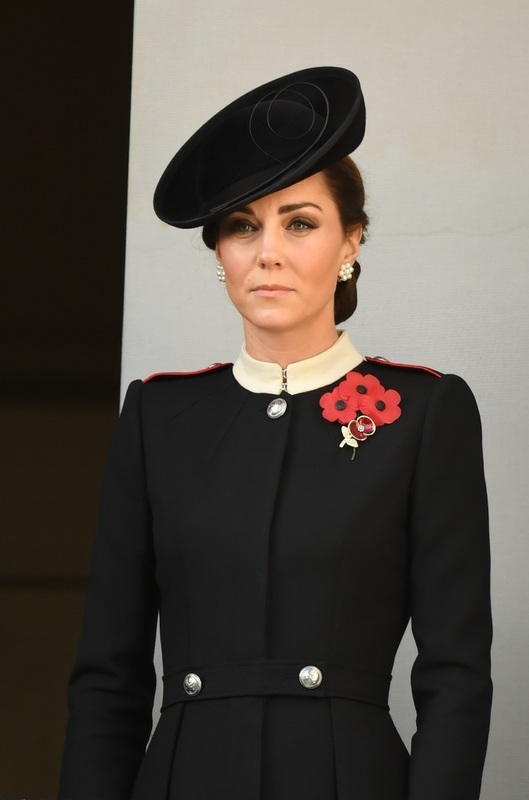 Today Duchess of Cambridge joined the members of British Royal Family to honour the brave soldiers who laid their lives for nation during World War. 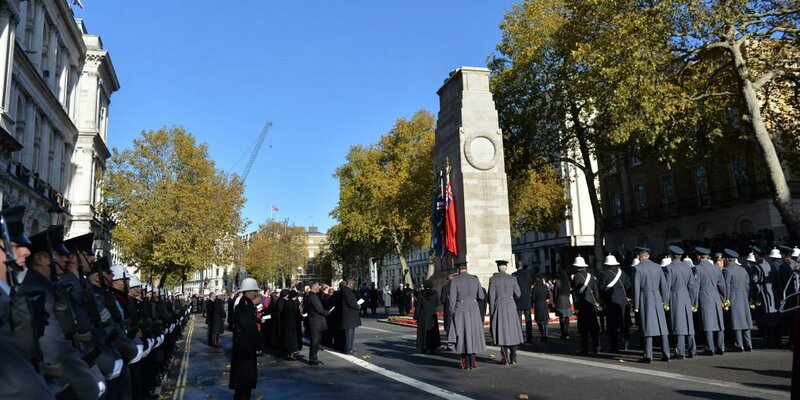 Every year at Whitehall, British Monarch lays the wreath at Cenotaph to pay tribute to country’s war dead on Remembrance Day, a tradition inaugurated by King George V in 1919. Year 2018 is a significant year in the history as it marks the 100 years of signing of Armistice, end of World War I. At 11am on the 11 November 1918, the First World War officially came to an end. 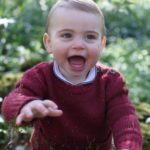 The announcement was met with obvious joyous celebrations across the nation, and crowds of people started to converge on Buckingham Palace. The First World War was one of the deadliest conflicts in history – claiming the lives of nine million combatants. Seven million civilians also died as a direct result of the war.On 4 August 1914, Britain entered and declared war on Germany, the Austro-Hungarian Empire and their allies. 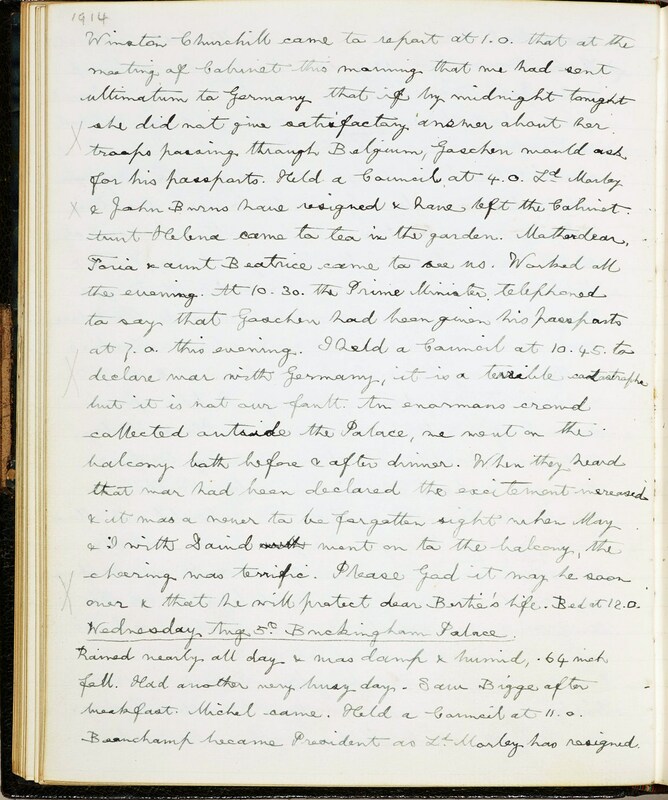 King George V recorded in his diary the events leading up to and directly after the declaration of war. He describes when war was declared a large crowd assembled outside Buckingham Palace which ‘was a never to be forgotten sight when May & I with David went on to the balcony, the cheering was terrific’. 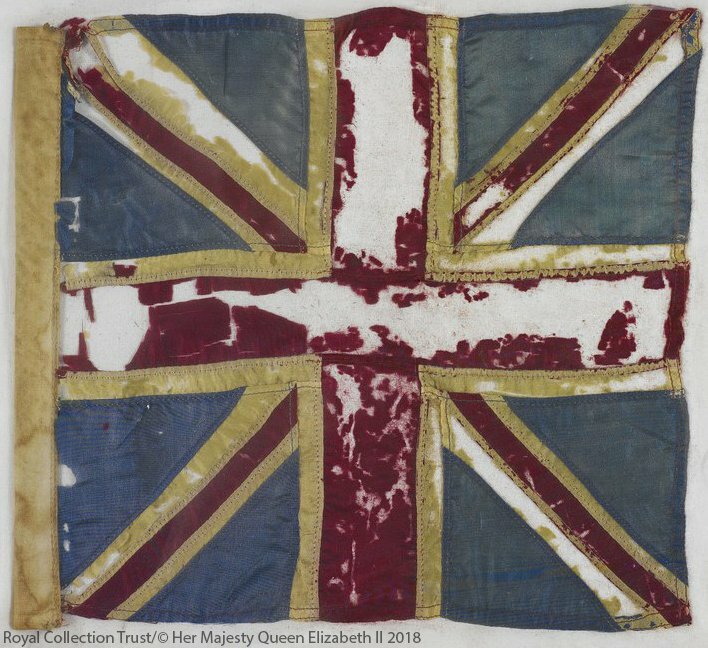 Show above is the flag Queen Mary waved on Armistice Day, during one or more of The Royal Family’s many balcony appearances. 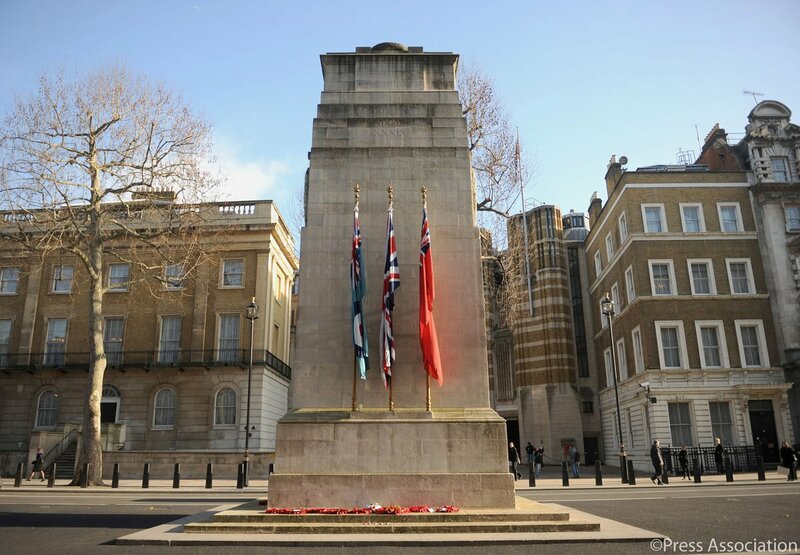 On the 11 November 1920 King George V unveiled the Cenotaph, the national memorial to the ‘Glorious Dead’ of the 1914-1918 war, and afterwards Their Majesties attended the burial service for the ‘Unknown Warrior’ in Westminster Abbey. 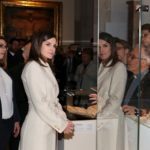 2018’s remembrance Commemorations involved commemorating the centenary of Armistice. 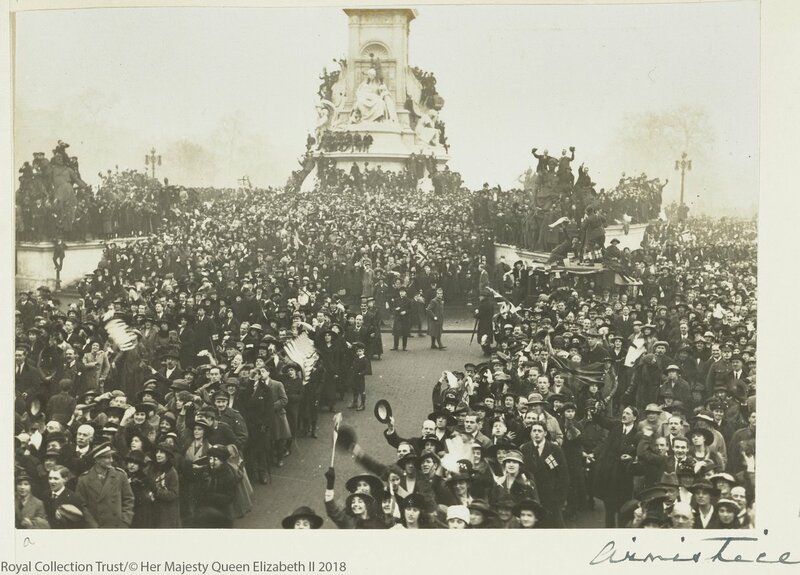 Learn more about World War I and Armistice Day through Royal Archives here. 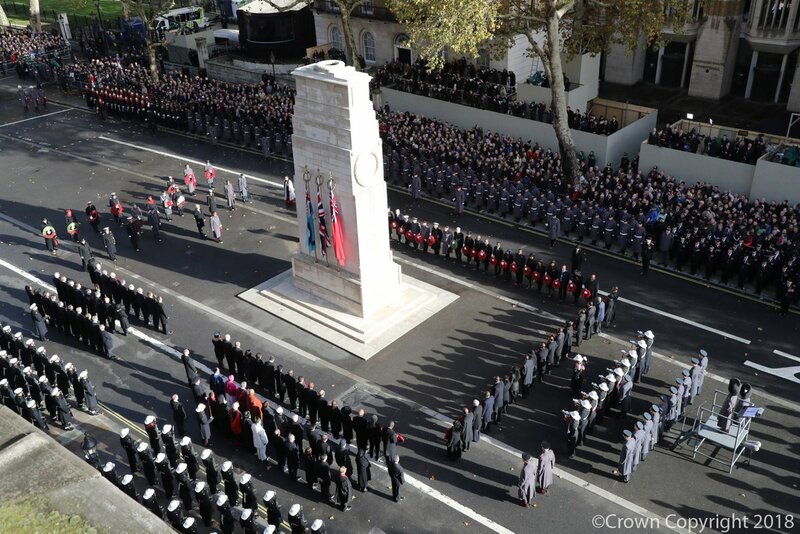 100 years on, The Queen and The Royal Family today joined the nation in remembering all those who made the ultimate sacrifice. 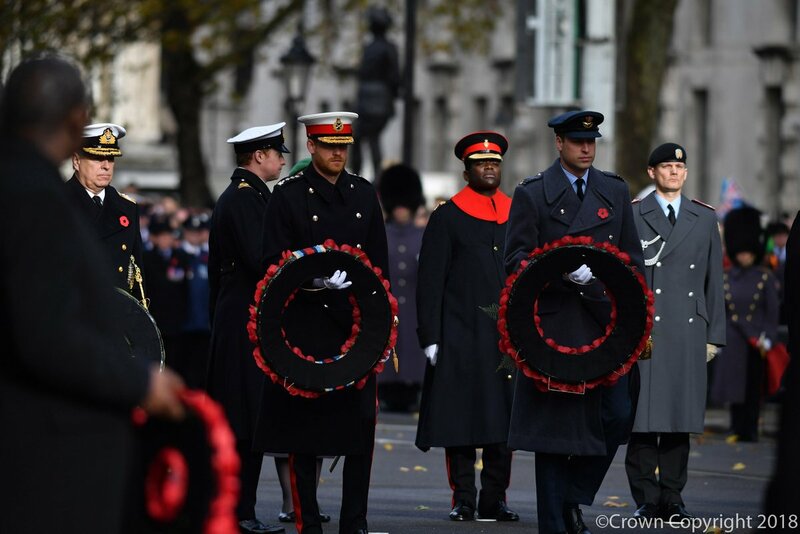 More than 10,000 people from across the country joined together on the Mall and made their way around St James’ Park for Remembrance Sunday as part of a ‘nation’s thank you’ to those who fought in the Great War. 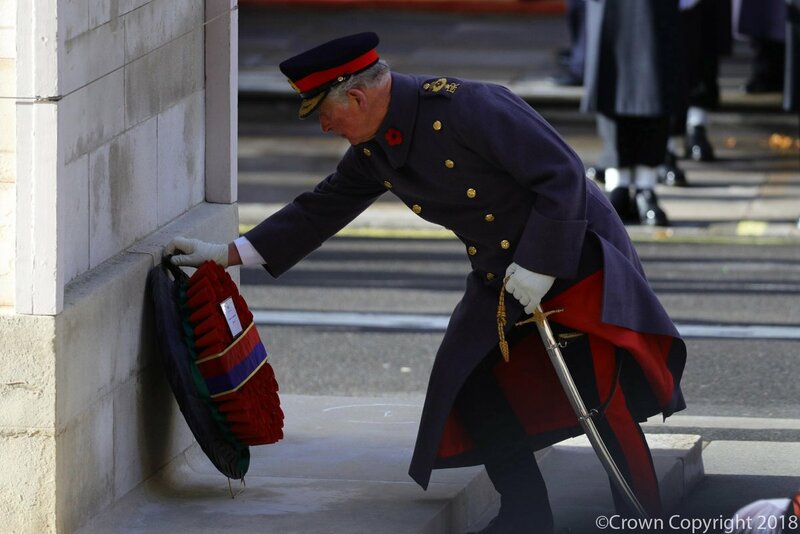 On behalf of Her Majesty, Prince of Wales Charles laid the wreath at Cenotaph. An Equerry laid a wreath on behalf of The Duke of Edinburgh. 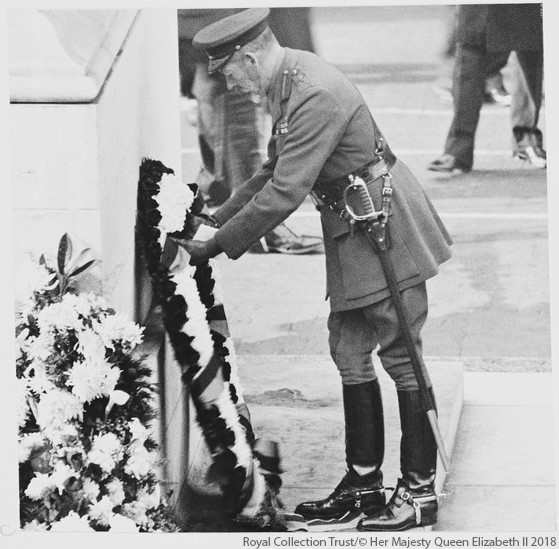 Since the coronation of Queen Elizabeth in 1952, today was the first time when Duke of Edinburgh was not present at the Cenotaph with Her Majesty. 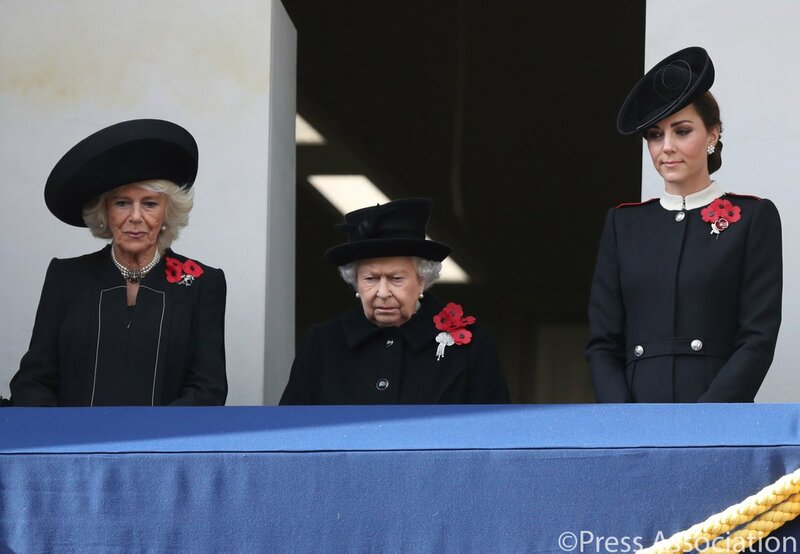 Absence of Duke led to another strong message, Queen was joined by Camilla, Duchess of Cornwall and Catherine, Duchess of Cambridge, both future Queen Consorts, at the balcony of Foreign Office. 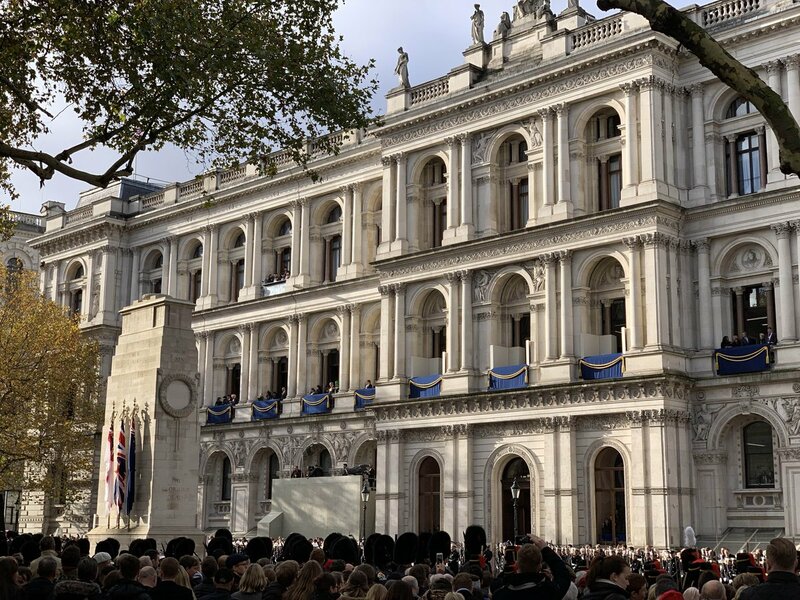 Prince William and Prince Harry followed their father and laid wreaths at Cenotaph to honour the fallen soldiers followed by politicians and dignitaries while Queen watched from the balcony. 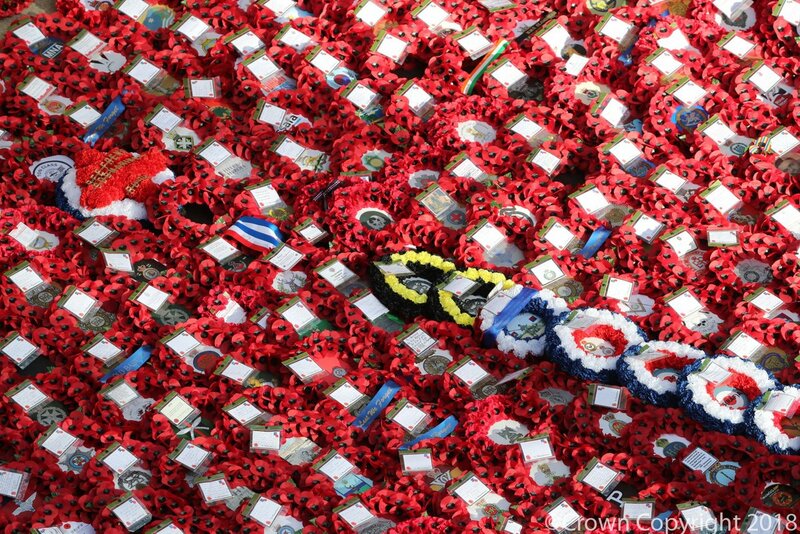 At the eleventh hour, the nation observed the two minutes silence to remember the fallen. The silence represent the armistice was signed on the eleventh hour of the eleventh day of the eleventh month in 1918 to end the World War I. The silence began with the chiming of Big Ben – despite the ongoing renovations to the clock tower. A small video of the day from Sky News. 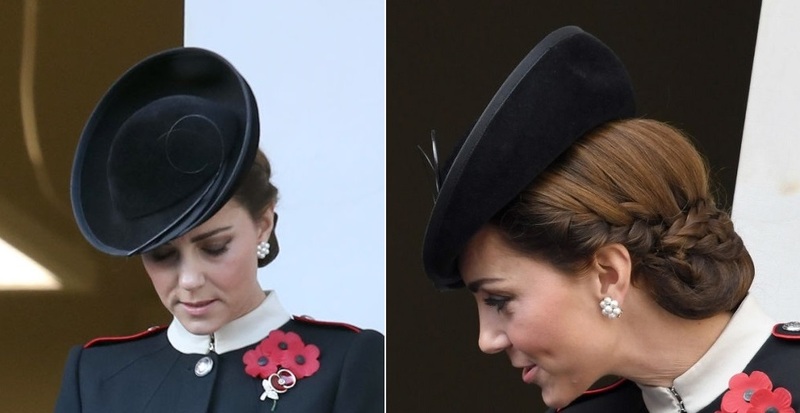 Catherine, Duchess of Cambridge, has attended the annual remembrance service since 2011. 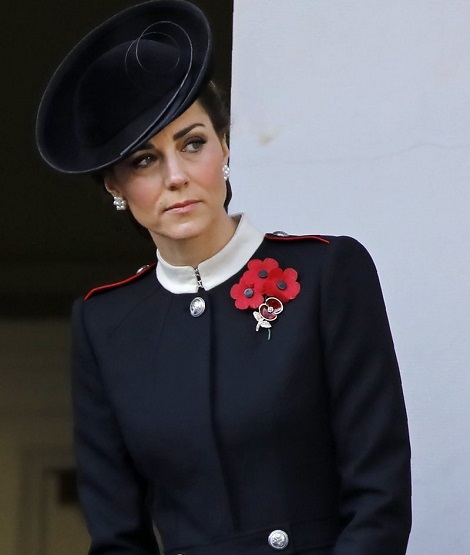 Today she wore a bespoke black coat dress from her go-to label Alexander McQueen. 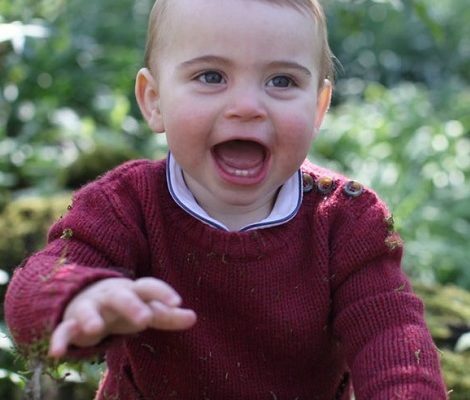 The dress is a combination of label’s Military lace insert jacket (ided by @princesskate_GB on twitter) and Military jacket (ided by @HeavenQRF on twitter). 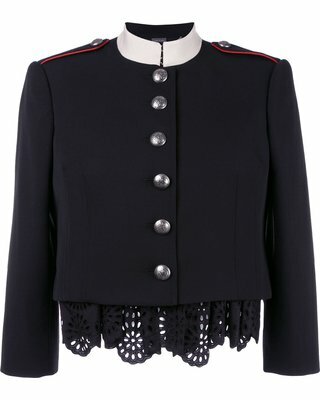 Crafted from wool, the tailored fit dress featured a contrast white collar, metallic button fastenings with waistline, epaulettes. 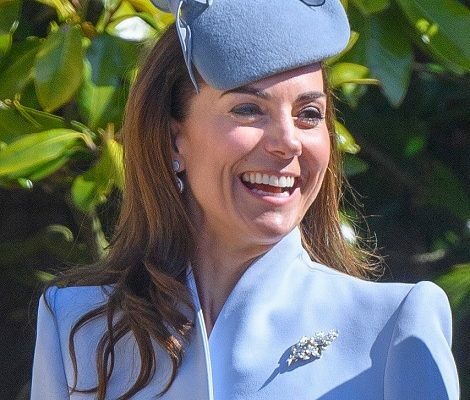 Duchess paired the coat dress with a bespoke Abney hat from Lock & Co Hatters. 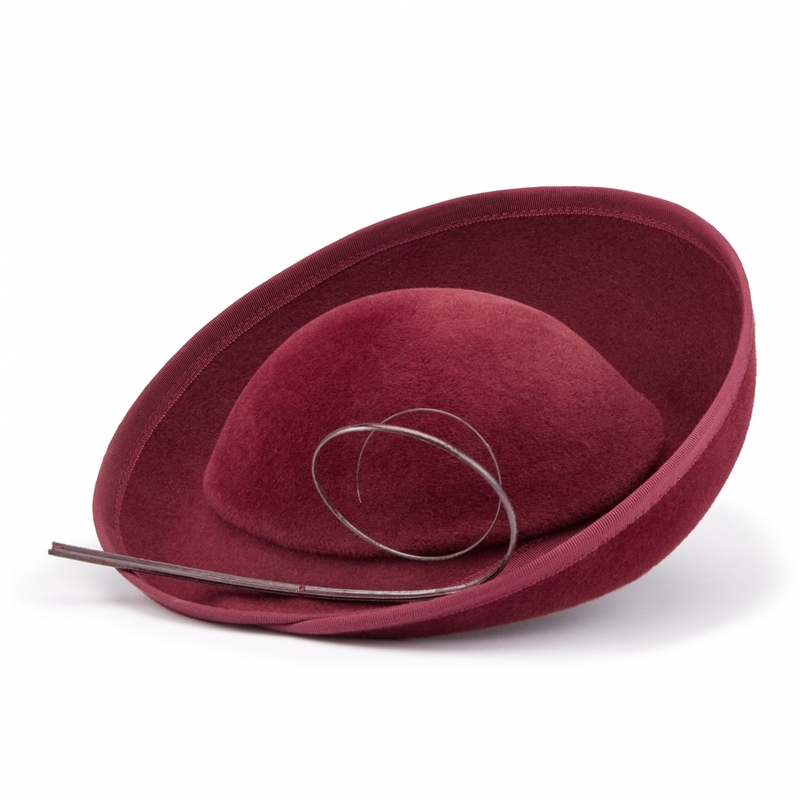 Coming from Label’s Autumn-winter Collection, the £795.00 is currently available in burgundy and brown colours (shown here in burgundy). 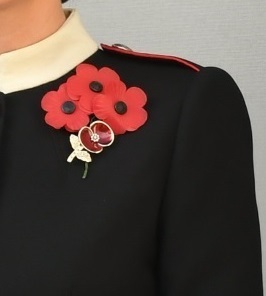 Catherine accessorised the coat dress with 3 poppies and Women of First World War Poppy brooch that she first wore during a visit to Imperial War Museum last week. 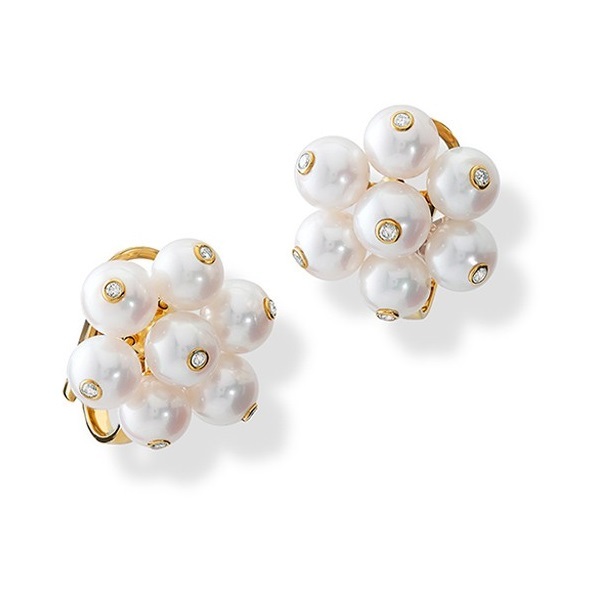 Duchess was seen wearing her Cassandra Goad Cavolfiore Pearl Studs that we first saw at the christening of Prince Louis in July this year. 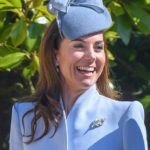 In the evening, Duchess will attend a special service to mark the 100 years of Armistice at Westeminster Abbey with Royal Family.